The two terms in the title are not connected. Fort here refers to the St. George’s fort and FDFS refers to the tradition of ‘First Day, First Show’ in the realm of movies. This iconic structure can be claimed as the Father of Chennai. Once upon a time, the English built this fort on an uninhabited land. The small town of Madras developed around this building, which aided trade and commerce. 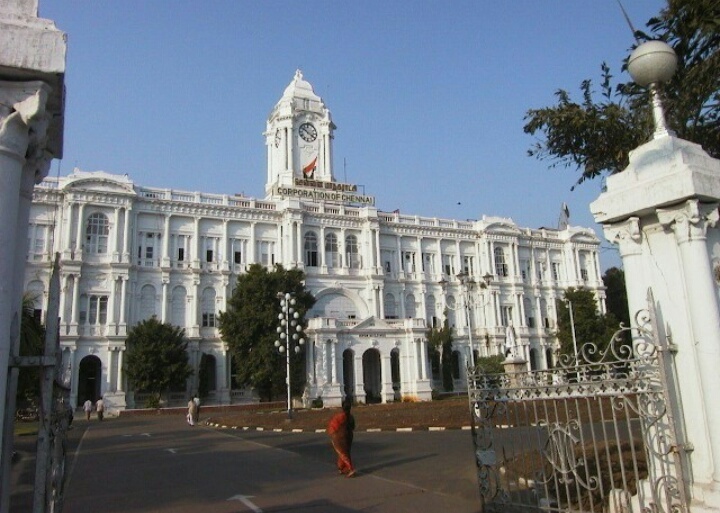 373 years and still going strong, this building now is the seat of the Legislative Assembly of Tamilnadu. It houses various other departments of the Government. The flag mast of St. George’s Fort is among the tallest in the country at 150 feet. Chennai is charming in its own ways. I love it due to its quaint buildings and a rich history behind the names of many buildings and roads. Ah! This is a special tradition that every movie buff would want to experience. A FDFS of their favorite star’s movie. Tamil Nadu has historically been a very movie oriented region. We have had movie stars as Chief ministers and movies have sown seeds of inspiration to many out there. The FDFS culture is prominent here owing to this culture. The culture of viewing movie stars as larger-than-life figures. The sight in front of any prominent theatre in Chennai is something to behold, on the day of release of the movie. We would have unprecedented crowd, traffic snarls and if luck favors, we could even catch glimpse of a fan or two dunking gallons of milk over a hoarding of the movie star. All of this in a day! Chennai has several cinema halls that have a rich history. Albert theatre, Kasi theatre, Woodlands, Devi complex, Udayam, Satyam theatre ( before it became SPI cinemas) have all stood the test of time and have succeeded in reinventing themselves to keep up with the technological progress in the movie screening process. With movie tickets costing only Rs.120/- at the maximum (yes, it is an upper slab foxed by the government) what more could a movie buff ask for?? Be sure to catch a movie the next time you are in Chennai. The experience is worth every paisa. This post is a part of the A to Z challenge. Love is not about meeting the right person. It is about being with that person till the very end. Have I been in love? May be. Have I seen people who are in love? A much more sure type of “May be”. Have I seen people who stay with that person because of love? Yes. A resounding yes. Those “people” would be my parents. To think and realise that they celebrate their silver jubilee anniversary this year is amazing. I have seen them both at their best and also at their worst. I have seen them squabble and make me hate the entire universe, and I have also had my own share of “Awwww” moments seeing them together. It is that love and commitment that makes up for all those slight imperfections. I learn from them every day. Every moment with them is a life lesson for me. Marriage is not about the glitz and glamour that comes with it. It is about the life after that as a couple. It is not easy to keep holding hands even when one’s world is falling apart. Marriage makes us do that, precisely. “In my life, if I am half happy as you guys are in your marriage, I will consider myself lucky”. Yes, Appa and Amma, you may not be the perfect couple for the world, but then you are perfect for each other and that’s what matters more. I feel so overwhelmed that it is hard to get words out of me right now. So you know what I did? I tried taking some of your pictures and also get a few people to talk of you both. I hope you are surprised enough! Five years in Namma Madras and Me not having visited Mahabalipuram was a shame not just for me, but for my entire extended clan. I know that it was unjustified but then better late than never, right? So yes, my friends and I set out on a trip to Mahabs on a chilly Sunday morning. Mahabalipuram is a coastal town near Chennai which is known for its Rock cut temples and sea shore. It was an ancient port town which was the port of contact for trade connections with South East Asia. It has exemplary historical identities that were carved during the Pallava Rule. I have been to Mahabs before but that was a trip to a resort there and not to any of the tourist spots that were famous. So this time around I was determined to visit the maximum places and have my own kinda fun. So we guys had breakfast in a restaurant in Uthandi and sped away to Mahabs. About 30 minutes of drive later there we were!! A bustling town that rakes in revenue in the form of tourism. I had always thought that this place was overrated by people, but then how would I know that I would be proved wrong like this? Our first stop was the Shore Temple. It was a lovely place and my favourite of all the places that we had visited in the town. It was a temple on the sea shore and was picturesque. The area around the temple was neatly laid out and designed and was a very pleasing sight for the eyes that were sore of the city way of life. Our next stop was the Five Rathas. These are structures that resembled Chariots and were actually carved out of a single stone. These are named after the Pancha Pandavas ( Dharma, Bhima, Arjuna, Nakula and Sahadeva ) and Draupadi of the Mahabharatha. This is a UNESCO World Heritage Site and rightly so. The way these structures stand today is a testimony to architectural marvel of those days. There was also a Sea shell museum and an Aquarium there. Man! I totally loved the sea shell museum. It is said to be the personal collection of one person and it was damn lovely. The guide who was in charge of the sea shells was amazing and patient enough in explaining the speciality of few of the collections kept there. ( Watch out for Breath Mary while you are at it, peepals) . We then broke for lunch and loitered around for a while there in the lawns adjacent to the Varaha Cave and Arjuna’s penance. Arjuna’s penance was our next destination. This place is said to be the place where Arjuna receives the Pasupatastra from Lord Shiva and also where Ganga falls on to Lord Shiva’s head and flows. This place has very intricate carvings and are very much descriptive of the mythological event. We then proceeded to the Maritime museum and another archaeological artefact museum which were very much interesting to check out. People who dig maritime stuff and related old time tech will absolutely adore the place. Light house was the penultimate stop for us and that was so crowded for we had reached there at the perfect time. The view from atop the huge structure was breathtaking and we could catch a glimpse of the IGCAR also. Will a trip to Mahabalipuram be complete without a beach visit? Never! So off we went to the Beach and had the customary Feet-wetting ceremony in the cold waters of the Bay of Bengal. That was it. That did tire me out after about 6 odd hours of total enthusiasm. All that I remember now after that point was that somehow I managed to get back to my place and am typing this post about the memories that I had managed to make during the day. While it has been a desire for my family to visit Dhanushkodi everytime we visit Rameshwaram, it so happened that I beat them to it and get a chance to go there. It was one of our perennial outstation work and being stuck up in the dry district of Ramnad, it was on one scorching afternoon that we decided to head to the Ghost town of Dhanushkodi. Rameshwaram , I have always loved for the beauty of Pamban and also for the incredible Engineering marvel that is the Cantilever Rail Bridge. Dhanushkodi had intrigued me since long. I had read about the history of the place and was waiting for a chance to visit and I got my chance, Thanks to an Audit Assignment. So we, my friend and I set off on a jeep to Dhanushkodi (Jeeps are the only mode of transport to and from Dhanushkodi)late in the afternoon. It was a bumpy ride, literally, because the path was marshy and uneven. The scenery caught my eyes first. I went all “WOAH! !” The sand was all white and the landscape was barren. Not one tree around and rare sight of bushes and grass. It felt surreal. I really felt a rush of feelings, some happy that it was probably the most silent and peaceful place I have ever been to and some of utter despair because this was one place that was bustling one night and was completely doomed the next morning without a trace of live. It made me all philosophical thinking how short and fickle life is. I made a mental note to tell all my dear ones that I LOVE THEM, coz nobody knows if I might me alive the next day. And so, we roamed around , went and stood in the beach. That was a beautiful moment to spot the confluence of Indian Ocean and Bay of Bengal to my left. Indian Ocean was rough and the Bay was calm and to see both extremes rushing onto each other made me smile. The sea was of a brilliant shade of blue , soothing. We also saw the ruined remnants of the Church and a rail track that had the ill-fated Boat mail once upon a time. Apparently this is a Ghost town which was ruined by the Cyclonic storm in 1964. The storm was so bad that it triggered a tsunami and wiped off the entire town , overnight. The only form of human beings that one can see there is the people who sell fish for a living . Even they wind up and return back to their homes in the mainland by 5.30 PM. So try Dhanushkodi guys! Worth your time and a perfect place to contemplate and realise how small we are in this whole wide universe.